‘Noticeable’ climate change | Climate Etc. Climate changes. How often? In what direction? What is actually meant by ‘climate change?’ Is the current definition useful? To address these questions, we examine Central England temperature (CET) dating to 1659 maintained by the Met Office, and also the author’s own reconstruction of CET to 1538 that uses thousands of observational weather references, and place them both into greater context with information from the wider world. We then examine ‘noticeable’ periods of climate change within the period from 1538 to the present day that would likely substantially affect humanity and nature for good or bad. This analysis suggests that modern climate is less volatile, and temperature extremes less severe, than in the past. Here is CET back to 1538; the portion prior to 1659 is my own reconstruction. Why use CET? As the worlds’ oldest and most scrutinised instrumental temperature record it usefully covers much of the ‘Little Ice Age’ when the most extensive recent glacial advances in the Holocene began, whilst numerous contemporary records make it possible to examine earlier periods in British climatic history. (See note 1 for a correct definition of the LIA by Dr Mann). Also, many scientists believe that CET, being calculated from a number of widely spread locations, in combination with the geographical location of Britain, is demonstrated to be a reasonable -but by no means perfect- proxy for global temperatures, and more notably that of the Northern Hemisphere. See Section Six of ‘The long slow thaw?’ for references to those scientists. The ups and downs of our annual weather can be seen clearly by eye in figure 1, but what exactly constitutes ‘climate’? In meteorological terms it is thirty consecutive years of averaged weather, which may or may not depict a trend showing a ‘change’ from what had become the ‘normal’ over a set 30 year period, currently 1961-1990. ‘Anomalies’ are deviations from the ‘normal’ period. Any comparisons of models or actual temperature records will therefore depend on whatever ‘normal’ period they are being compared to. Thirty years to establish a climate state seems a long time, as within that period there may be notable shifts to a number of different prevailing patterns of cold/warmth/wet or drought that, on a human scale affects agriculture and horticulture by impacting on what crops may be grown successfully, may affect the tourism season, may cause a consumer to use more or less energy in their home, and also impact on nature by affecting the populations of wild life and vegetation. So in practical terms, when we consider ‘climate change’ it may be useful to consider periods other than thirty years. To do that we need to have adequate records that can accurately plot those ‘noticeable’ periods shorter than 30 years. The set of modelled hemispheric temperature anomalies to the 10th century depicted below are derived from a variety of proxies including boreholes and tree rings with instrumental CET-from a third party-apparently plotted at approx. 40 year intervals. The newer models in figure 2, such as Moberg at al 2005 (Northern Hemisphere) show somewhat greater variability than many of the other models. 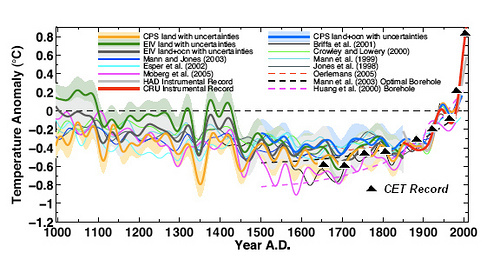 Moberg et al also fail to show the hockey stick by terminating the study prior to the modern uptick derived from the incorporation of the instrumental temperature record. A critique of Moberg’s paper is given in the link above. In CET, the plotting of annual temperatures allows a close focus on the often astonishing yearly variation. CET is arguably more indicative of actual climate variability than climate model simulations and imprecise proxies (such as tree rings) which reflect greater spans of time and larger uncertainties on dating and spatial coverage. In order to see what the climate’ has been doing over the last 500 years and to try to determine ‘noticeable’ periods of climate change i.e. which may affect humanity and nature, the CET data has been divided into 10 and 50 year segments. So what periods of temperature increase or reduction constitutes a ‘noticeable’ change in the climate? This warming was very wide spread from the 1920’s to the 1940’s and included the ‘dust bowl’ years in America, retreat of glaciers and the warming of the arctic to levels that approached, but probably did not reach, modern levels, as was noted in this previous Climate Etc. article. 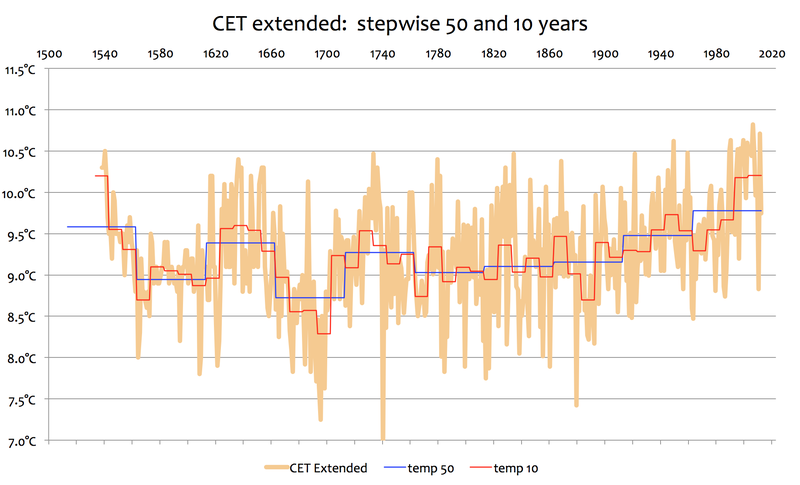 The CET data for the period indicate a distinct climate shift of some 0.35 degrees centigrade on a 50 year basis, but rather more on a decadal basis, so that well documented era can usefully be our benchmark for temperature comparisons, whilst demonstrating the usefulness of a decadal time scale in determining a change in the climate that is ‘noticeable’ and has an impact on humans and nature. Stepping back in time demonstrates further the utility of examining decadal-rather than 30 or 50 year periods- in accurately identifying ‘noticeable’ changes in our climate that some other proxies -utilising longer time scales- may fail to fully pick up. For example, we can see that the period around 1880 showed some astonishing variations according to our criteria, reaching a peak around 1865 before a cold decade set in from 1880, some 0.5 degrees cooler than the peak, before signalling the start of further warming that then became part of the 1920-1940 period noted above. However it falls within a 100 year period of apparent climate stability well observed in figures 2 and 3 above. Similarly, whilst the extent of the 1820 changes may be too short to be fully noted in the coarser scales of some non-instrumental proxy records, or in the 50 year segment, in the decadal scale it clearly stands out as a period of increasing warmth, followed by a substantial drop then a recovery. The notable warmth manifested itself in a melting arctic (not to modern levels) as discussed here. Lamb also points out that the decade from 1810 to 1819 was the coldest in England since the 1690’s. 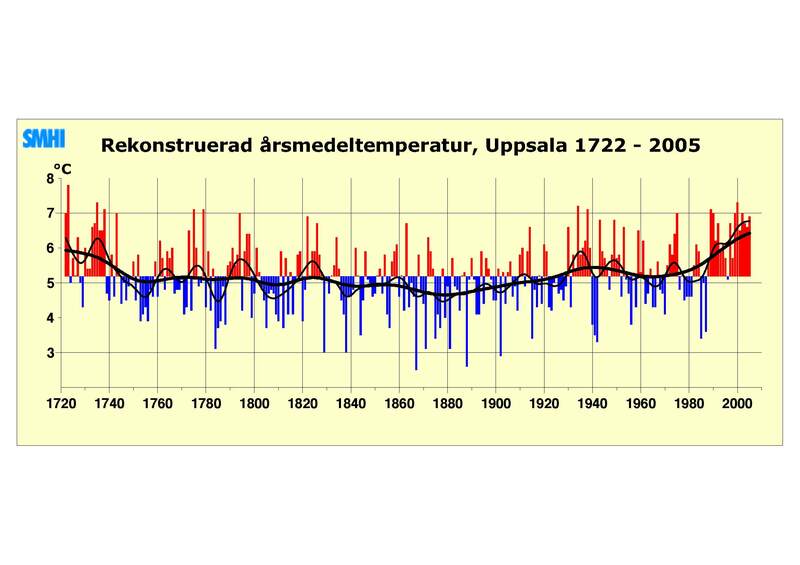 Although 1740 to 1830 appears to be a a period of relative stability according to the 50 year records, many warm and cold decadal periods can be noted. Prior to this however we had an interesting and substantial ‘hump’ peaking around 1730 that terminated the coldest period of the Little Ice age with an abrupt rise in temperature over several decades of some 1.9C unequalled in the record before or since. “Over the fifteen years between 1720 and 1735, the first snowfall of the year moved from the first week of September to the last. The coldest period of the LIA-around 1660 to 1700- is so well documented that its reality does not need recounting here, so this highly ‘noticeable’ climate change- with its precipitate temperature drop being well noted in decadal CET- can be passed over in order to be able to concentrate on the peaks that presaged it. A full definition of the likely extent of the Little Ice age as popularly understood is given under note 2. By providing additional material –and from a wider area- to that contained in the original article, we can validate both these unexpected warm humps-each representing considerable climate change which frame a much colder Little Ice Age interlude well covered in the literature. This is noted in Appendix one in this paper, but briefly we can reference Moberg et al 2005, Professor Pfister, Professor Brian Fagan, Professor Hubert Lamb, Professor Philip Jones, Dr Michael Mann and Sir Francis Bacon. Those of us living through the 1960’s and early 70’s in Britain may think of it as a cold period . Indeed the cool windy wet weather of the early sixties is what first encouraged my family to holiday abroad and in retrospect they were right. However, the substantial temperature change during this period is not quite enough to meet the benchmark of ‘noticeable’ climate change. This allows the point to be made that temperature is not always the sole matrix to use when considering ‘climate change’ as more or less sun, wind, or precipitation, may not show up in the temperature record but may nevertheless impact substantially on life. The benchmark definition of ‘noticeable’ climate change certainly applies however to the period from 1985 to 2000 (most clearly seen in figure 1) when the temperature increased by 0.8C and was followed immediately by what appears to be another period of ‘noticeable’ climate change in the opposite direction, not fully seen yet in the decadal record but visible in figure 1) -This has brought the annual anomaly back to the level of the 1730’s (but still relatively warm for Britain. )Curiously the first year of the record 1659 and also 2010 both ‘enjoyed’ exactly the same anomaly. This recent downwards turn in temperature can be testified to by the difficulty in growing a variety of crops and vegetables that flourished just a few years ago, so again the horticultural aspect seems a reliable indicator of climate change. Of course we can not yet know how long this reversal will last. So using the criteria of ‘noticeable’ climate change that would affect humanity and nature, that can be reasonably validated against the benchmark of the 1920-40 period by such records as instrumental and crop, or observations, and as being of a duration of at least one decade, we have some 15 decadal episodes of ‘noticeable’ climate change, (up and down) between1538 and 2012. As far as ‘hidden’ ones go, where the averaged instrumental record shows nothing that reaches our benchmark but the end result does, we have two identified to date; the 1960/70’s and the mid 1800’s where the winters became noticeably milder as noted by Noah Webster of Dictionary fame. It can be determined also that out of some 47 decades in the extended record to 1538, there were only two episodes of two consecutive decadal periods (i.e. each of 20 years) where the temperature remained essentiallythe same. It has gone down 21 times by various decadal amounts ranging from small to ‘noticeable’, and up 25 times using the same criteria. In fact climate change is the ‘norm’ rather than the unusual. Perhaps even more remarkable is that despite these climate oscillations, temperatures on a decadal basis remain bounded within the tight limits noted of -1.3 to 0.8C so giving a remarkable constancy of around 2 degrees C throughout the near 500 year record. Whether these bounds remain as the MWP is examined in Part two of ‘The long slow thaw?’, or will remain so in the future, remains to be seen. However, we can say with certainty that climate changes constantly up and down and that ‘noticeable’ climate change is rather frequent throughout the record. The seasons also broadly reflect the 2C boundaries, with Winter decadal temperature ranging from 2.8 to 5C, Spring 6.8 to 9.3C, Autumn 9 to 11.2C; however, Summer shows a much smaller decadal range between 14.8 to 16C, which brings the overall average seasonal range back to the overall 2 degree C boundary. 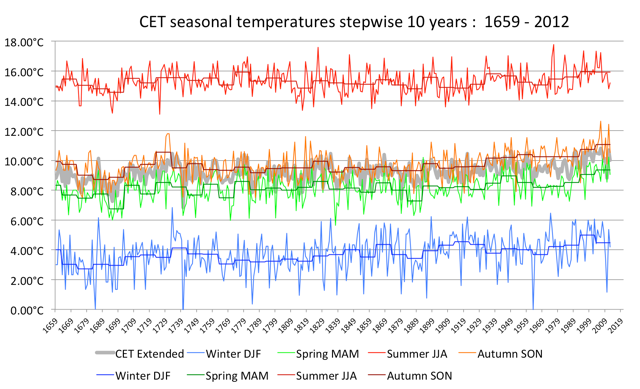 The seasonal CET to 1659 is shown below. Examining the much longer records in detail enables us to examine this claim. This suggests great variability in the past, not only on the decadal basis but in individual years and the seasons within those years. This possibly explains the greater incidence of extreme weather events of all types noted in the historic records compared to today, especially the prolonged periods of heavy rain leading to flooding. Curiously, drought also featured prominently, perhaps indicating the see-saw effect of natural climate change in past centuries noted in the passage above. The detailed observational records also pick up long periods of ‘similar’ weather, such as many weeks of rain or long periods of drought, which might indicate the jet stream being in a favourable or unfavourable position, or a blocking high etc. This is an area of current interest to the climate science community which the historic record might be able to throw some light on. The variability, extremes, volatility and extent of anomaly changes shown in the instrumental and reconstructed data are at complete variance with the paleo models in figure 2) with Moberg et al 2005 being the most notable partial exception. Why should this be? The paleo record is clearly showing a constancy in climate with a variability from 1500 to 1920 centred on around the minus 0.3 to 0.5C anomaly mark, for the core models. Yet the instrumental and historic record demonstrates much greater variability, albeit within relatively narrow overall decadal boundaries. Global temperature reconstructions using paleoclimate proxies-fit for purpose? 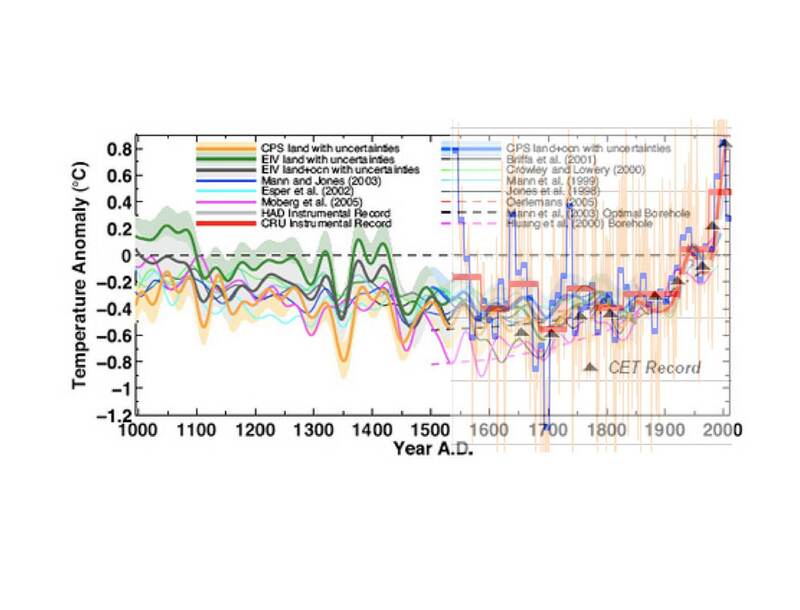 An examination of the reconstructed CET from 1538 (figure 3) shows that from the centre point of 1750 the decadal variability of around 2 degrees centigrade maximum remains the same throughout the record. However, within each half of the record there is great decadal variability, up and down within that range, with the greatest volatility clearly in the earlier half of the record, with the dip and recovery around 1690 and similar features during the early part of the 16th century and the start of the 17th century. Curiously, this variability cannot be seen at all in the core paleo reconstructions (figure 2) which appear surprisingly stable, with no greater variance than around 0.2 to 0.4C.degrees throughout the period 1500 to 1920 (by which time the instrumental record is utilised) . However, when stepping back to observe the relative coarseness of the fifty year record in CET (the red line) the shortcoming of the paleo reconstructions can be clearly seen as the coarser CET 50 year ‘paleo’ records also exhibit the similar (but slightly larger) characteristics of limited variability that the proxy reconstructions do. (This is with the obvious exceptions of the considerable perturbations around 1690). This effect is shown in Figure 4 below. Horizontal red lines are CET 50 year ‘paleo’ Horizontal blue lines decadal. Vertical brown lines annual temperature. Note; This graph is set to the ‘norm’ of 1961 to 1990 to match that of the paleo reconstruction and has a start date of the beginning of each decade. The colder period at the very end of the record straddles two decades, the last of which has obviously not yet been concluded and may yet change its character. The recent cooling trend can be seen in figure 1. Note: the paleo reconstructions in the earlier part of the record that coincide with CET ‘paleo appear to run a little cool. The coarser 50 year time scale noted in figure 4 appears to have completely masked the decadal variability of up to 2C through the record which is up to ten times larger than the paleo reconstructions using proxies. Comparison of the paleo reconstructions and CET instrumental data shows that the paleo reconstructions miss the great warming centred on 1730 the recovery around 1830 from the coldest decade (1810) since the depths of the LIA in 1690, and the final bursts of the LIA in 1840 and 1890. Looking further back, the paleo reconstructions also do not replicate the considerable drop to the depths of the LIA around 1690, the (reconstructed) warmth around 1630, the period of well documented cold at the beginning of the 17th century and the sharp (reconstructed) rise around 1540 to something apparently approaching the temperatures at the end of the 20th century. From this data, it can be seen that the limited anomaly temperature range observed in the paleo reconstructions appear to be a reasonable representation of the 50 year CET instrumental experience. However, it can also be seen that the paleo reconstructions display substantially less variability and range than can be observed in the real world CET decadal instrumental anomalies. The end result of this is that the incorporation of a somewhat volatile instrumental record (from 1900) on to the end of a somewhat static paleo reconstruction, has substantially altered the context of the paleo reconstruction. Each type of data represents a completely different range of anomalies and the end result consequently displays an ‘apples and oranges’ syndrome. *By any criteria, climate change is frequent, indeed the ‘norm’. Variability of our climate on a decadal basis is considerable. *These decadal episodes of variability are no more pronounced in the present than they were in the past -indeed the volatility appears greater in the past as can be seen in the sharp drops, then recovery, during the LIA episodes. *However, there are tight boundaries, with the frequent oscillations currently on a slightly rising trend from the start of the instrumental temperature record in 1659, albeit with a sharp reversal in the last 7 or 8 years. *There are some hints of a similar rise to broadly equivalent modern levels around 1540 in the reconstructed CET. *Rising temperatures reflect the relative dearth of ‘old fashioned’ winters in the second half of the record, as well as changes in other seasons, within their boundaries. Summers have the tightest boundaries, appreciably lower than the other seasons. * Paleoclimate reconstructions stretching far back in time using proxies that don’t capture the fine grain of the annual natural variability- can be somewhat inaccurate representations of what has actually historically occurred in the real physical world. *When instrumental records are not available, the historic record of the past millennium is likely to be a valuable aid to the development of paleoclimate reconstructions using proxies. 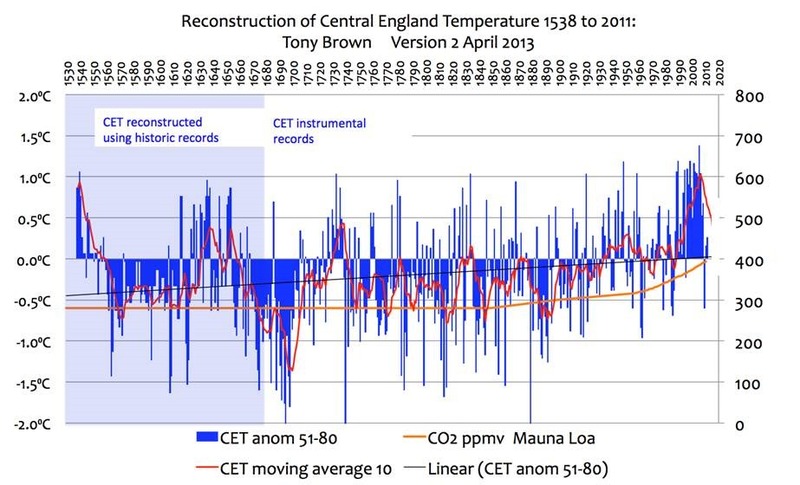 JC comment: This post is one of a series of posts by Tony Brown that interprets the historical climate record. This is a guest post; please keep your comments relevant and civil. A better question would be, when was climate change NOT ‘Noticeable’? and tomorrow the world. For example, try to deny it; good luck? Really nice piece of work. I wonder if you can run your seasonal temperatures through frequency analysis and see any cycles? I put the CET yearly average series through extensive spectrum analysis a number of years ago. Instead of relying upon jet-lagged memory, I’ll report the salient findings after getting back to my office tomorrow. The power density spectrum of CET shows the highest, sharpest peak at periods around 176 months; it and lower frequencies (incl. a hint of a 132-yr cycle) account for ~1/3 of total variance. A 176-mo MA (averaged bimonthly to reduce dither and provide a center point in the effectively 177-mo kernel) should show the climatic variations over the time-scales of human lifetimes quite adequately. Experiencing problems again with cursor control on this site, preventing a longer comment. What’s going on here, Judith? comment from yesterday with unintentional line-breaks that I cannot edit. Sorry for the typographic mess. cross-spectral relation to a NW Europe index of stations that brackets C.
frequencies of similarly UHI-corrupted indices, such as HADCRUT and BEST. That’s Tubby, H/t L.C. Douglas. And those like Lamb and countless others around the world devoting themselves to keeping good records for their future colleagues in science must be turning in the graves with anger to see all their hard work trashed..
kim. Thanks. That is my basic creed. ‘Disputed Passage’, by Lloyd C. Douglas, p. 12; Grosset & Dunlap, New York, 1938. My manimanued copy is inscribed ‘To My Husband with Love — Anna Laura’. and lettin’ the gold slip through, I’d say. you mean modern CET climate. for example, one way to think about climate is ‘what the weather is typically like for this area’ example: a tropical climate. In certain areas, like the tropics, where there is no large seasonal difference, that doesnt change much under a warming scenario. In other small areas, like central africa and SE US, the seasonal difference grows, But the most dramatic difference is in those areas, mostly northern hemisphere where the seasonal difference is shrinking dramatically. Put another way, in a warming world we are seeing a reduction in the seasonal range for much of the northern hemisphere. So in colder world the swings between seasons were greater, as the world warms that warming does not express itself uniformly. Its not spatially uniform and its not temporally uniform. Go figure the climate is complex. So, we see small changes in tropical climate ( cause its already.. well tropical one could even say that the tropics seem well regulated) and more changes in northern hemisphere winter seasons. And even here the UK is somewhat of an outlier, as is greenland for different reasons. Yes, an island would make a terrible proxy for global climate, their weather being influenced and moderated, as they are, by oceans. Which everyone knows are no part of the globe. Because otherwise that might imply that oceans moderate global climate in general. And we KNOW that can’t be true. you beat me to it Gary. It is also the case that you have to work with what you have, not what you want. areas that change a lot ( inland) and areas that change less, by the coast. You do not get the complete picture by looking exclusively at one or the other. This has nothing to do with islands being “a part” of the globe or not. For example, if I pointed to siberia where the biggest changes are happening and pretended that was the whole globe you would scream. If I pointed to arctic ice you would point to antarctica. If I pointed at rural stations, you would point at urban ones. Tony points at a northern latitude island. geography matters. Now I am not suggesting that people ignore this tiny island nation, but rather that they need to put the data into a larger context. What that means is that you can learn things by looking at it, but you can also fool yourself..
“you beat me to it Gary. climate change, you have to understand that if all you have to work with exhibits a unique bias then you had best caveat your conclusions accordingly. Perhaps if it is so simple, you can explain it to all those simpletons who keep publishing all those graphs labeled “global warming” that only include land surface air temps. And you misconstrued my comment. I did not suggest you were leaving islands out of your definition of the “globe.” I said you, and other warmists, like to leave the oceans out. As in reporting the aforementioned “global” average temperature records which only include the land temps which are much more responsive to short term spike in temps like we had previously. But I think Mr. Mosher is making an excellent case for rejecting proxies in general as a basis for making drastic policy decisions with respect to climate. Albeit unintentionally. Beat me to this one Gary. The focus of the warming crowd on land temps reminds of me of the old joke about the drunk searching for his car keys under the street lamp, even though he lost them a block away. “But this is where the light is!” Is his answer. Yup, when one focuses on temps on the strong MINORITY of the planet’s surface, must be because that’s where the light is! I am one of those simpletons who makes the astute observation that people live on land, and that’s why land temperatures are important. As Mosh says it is also to look at the proportional ocean/land temperature split because that number seems to be diverging. Take a look at this chart which shows the ratio of ocean to land warming as a fraction, f. The fraction is dropping so that more heat is entering the ocean at the expense of the surface. That could be an insightful comment, if the issue were whether land temps were important. Unfortunately, the comments were about the meaning of the term global, and the temp graphs labeled global that are merely land surface air temps..
Snark works a whole lot better when you make fun of the actual content of the comments you are responding to. Otherwise you come off looking like a…well…simpleton. Obviously, the land does not act like a semi-infinite heat sink so the land temperature is closer to a true ECS, and not a TCR, which is what the ocean is closer to. The land temperature is in fact the most important metric that we have. Like I said, you can read Isaac Held’s last blog post or mine that I referenced above. There is a vast difference between Isaac Held and the Webster’s global algebra and fantasy physics. It is hilarious that he imagines some equivalence. Isaac Held called his analysis “a very simple approach” . You do these very simple approaches because that is how you reason about complexity. If a GCM is going to give you an answer, you are going to want to decompose that result into something that you can talk through and wrap your arms around. Of course, the Chief of KAOS/Control wants to keep everything as muddled as possible because that plays into his strategy of spreading FOO and FUD. Let’s see if this goes in the right place. Thinking about how things actually work instead of pulling it out of your arse is one difference between you and Held. Thinking beyond the global mean time series another. Of course the Held blog had nothing to do with land/ocean temperatures – so that’s another difference. Having some credibility as a scientist yet another. Let face it – you are totally outclassed. Indeed class and you have nothing in common at all. Nothing to say about the comment below? I am more than a little bored with your incompetent nonsense. That’s nice that you are bored. It’s a sign of intellectual laziness. Funny you should mention that as this was a topic at our last meeting. Without a doubt there are some people, on blogs in the press, who mislabel land charts as “global”, but in the science you varying degrees of this. I prefer to show simpletons how to do it rather than ‘explaining” it too them and I think your best course of action is to acknowledge people who do it right and don’t tar them with the same brush you tar others with. Your inability to distinguish between those who do it the way you want and those who dont, diminishes your credibility and your standing when you attempt to tell me what I should do. should go up with the next web site revision. Give it a month or so. As we have some work to do on the write up. I don’t know what you mean by “liking” to leave the ocean out and I don’t know what kind of evidence you would consider to be counter evidence to your claim. Clearly ocean series are published an updated. Clearly papers are written about the ocean, even problems with ocean data. Clearly we have discussed the ocean here at climate etc and one of the scientists came to discuss some issues with greg goodman. So, what would falsify your position. Nothing, because your position is irrational. Yup you will see some folks cherry pick the land to make points. Hardly. ANYTHING can be the basis for a policy. What the policy maker had for breakfast can be a basis, albeit a bad basis. proxies are what they are. They are uncertain. But that doesnt mean they have no use whatsoever. Let’s take CET. By looking at the modern period, we see that CET underestimates the changes in seasonal range relative to other northern latitude areas. It forms a lower boundary. Boundaries can inform a policy maker. Here is the point. I don’t favor rejecting any data out of hand, data with all its biases and uncertainties is all we have. From that data you draw conclusions, like all conclusions it will have biases and uncertainties. different than making an engineering decision, or financial decision, or house color decision. It’s also different from a statistical decision. In short Making policy decisions is not science. It can be informed by science, it can benefit from from science, but its not science. Much of our problem today is that people have tried to reduce policy to science. Rather than fight that by denying the science, I fight that by arguing that policy takes science into account, but its clearly not ruled by science. Anyone who thinks decarbonizing the global economy will only cost “1-3% of GDP” is delusional, both about the almost certain impacts of such a policy, and of his ability to have any idea what the actual cost of such a radical reordering of society would cost. 1. I’m not referring to the cost of decarbonization. Gore, would say to mitigate our venting of C02. since none of these men are delusional, your comment doesnt seem supported by any evidence. The paper you referenced comes from the authors of working group three of the ipcc and is ten years old. Do you feel that is the most up to date and objective information available for us to make decisions on? You keep getting it back to front Paul. Atmospheric temperature for both land and above oceans is driven by ocean heat. The land/ocean contrast is because of water availability – and therefore differing lapse rates. Hence no difference in the troposphere – as opposed to the surface temps. But rather than anthropogenic – late 20th century ocean warming was the result of cloud changes associated with ocean and atmosphere circulation patterns. I suggest you look at some actual science rather than blog science. Especially your own which seems especially simplistic and misguided. I appreciate this is anecdotal but it chimes with your comment about late 20th century ocean warming being associated with cloud changes. Thinking about how things actually work instead of pulling it out of your arse is one difference between you and Held. Of course the Held blog had nothing to do with land/ocean temperatures – so that’s another difference. Having some credibility as a scientist yet another. Let face it – you are totally outclassed. Indeed class and you have nothing in common at all. Isaac Held considered north vs south hemispheres which is really an imbalance of ocean vs land temperatures. No, it is really an imbalance between hemispheres. The average delta T between oceans and land is about the same in both hemispheres. Since the Antarctic is thermally isolated by the ACC, the SH is a more efficient heat sink and the opening of the Drake Passage and possilbly the closing of the Panama gap crated an approximate 3.2 C hemisphere imbalance and an approximately 0.6 C zonal imbalance. Cappy, you are what we call an impediment. People that read this stuff see your title, Captain, Chief, whatever and realize that you have an authoritarian streak and immediately dismiss it. Right, it gives you a strawman to avoid the obvious, asymmetric internal heat transfer impacts sensitivity. It was about the source of greenhouse gases in the NH ultimately mixing into the SH atmosphere. Nothing to do with land and oceans at all – raising the flag to see if anyone salutes – and certainly nothing like your simplistic and misguided algebra. Golly – is this a sign of agreement between Mosh and Willis E? Of course. The problem is that willis thunderstorms dont cool the planet. the tropics stay well regulated.. the heat gets pumped northward. So the notion that stability in the tropics ENTAILS stability over the whole planet is not supported by any analysis. In fact I see willis work as confirming what climate science says, but he hasnt figured. Stability in the tropics comes at a price. A price paid in the arctic. Stephen Mosher: you mean modern CET climate. That’s basically it. This analysis shows that in some places at some times, it is possible for local climate to have changed more rapidly than can be recorded by the diverse climate proxies. Claims that the rate of modern changes is “unprecedented”, therefore, are insubstantial; as would be claims that past climate changes really were as rapid as has been observed recently in the recorded data. If there had been such rapid fluctuations, the proxies would have filtered them out; if there were such rapid fluctuations, the proxies did filter them out. Whether there were such rapid fluctuations remains undetermined. a conclusion that claims certainty. Claims that modern changes are unprecedented are not insubstantial. neither are they certain. In your attacks on climate science try not to commit the same overstatements that your opponents make. OK. I’ll fall back on “unsupported”, which was my first choice. A statement that tells us to be very skeptical of primitive tribes such as the Mosherians. Carvalho 2007 shows in a tale of two islands (UK and NZ) that anti persistence is persistent, in both climate records over a couple of centuries and that the reversibility of regimes on decadal timescales when mapped onto random walks meets the Hurst criteria. The title that PJ used is a play on Mandelbrots Nile paper and use of the nileometer with the Hurst Exponent and is essentially an interpretation of the Pharaohs dreams. One fundamental problem in using any single location is that there’s much more noise in local temperatures than in global or wide area averages. Due to the noise it’s much more difficult to identify any particular signal in a local time series than in a wide area average. That there’s much more noise cannot always be noticed from graphs, because the scales are often chosen in proportion to the amount of noise. Thus the curves may look similar, until it’s realized that this just an illusion created by the choice of scale. However, Pekka, if one uses an average of multiple locations, which are most certainly NOT measuring the same variable, what value is ther in averaging them? It’s like me saying I’m going to,average the 0-60 speed of every car on the planet to get at the global automobile acceleration rate. Really? Pekka, that’s one of the major problems. With the noise being so much greater than the signal, averaging over many different locations is more likely to give you an average of the noise than the underlying signal. It’s obvious that neither one of you understand anything about statistics. Both comments are absolute nonsense. If you don’t know, what happens to the signal-to-noise ratio in taking an average, you don’t know anything about statistics. That’s one of the very first and most important issues in any course of statistics. Only if you’re sure that the noise in your samples comes close to averaging out to zero. So exactly what signal are you measuring when you consider temperature sensors at multiple locations? I’d say you are measuring two distinct temperature series. Series 1 at location 1 and Series 2 at location 2. Now why would the signal-to-noise of Series 1 improve by averaging it with Series 2? That’s like I said before: if I measure the acceleration of an Audi A6 and the acceleration of a Hyundai Elantra, then average them, what exactly have I improved the signal-to-noise of? The Armagh record is of similar length to CET and shows an even flatter record, which I guess means Ireland is even better proxy for North Altantic temps than CET. We may be in a climatic optimum. We know about the Holocene Climate Optimum or aka Hypsithermal, Altithermal, Climatic Optimum, Holocene Optimum, Holocene Thermal Maximum, and Holocene (according to wiki). From what we know the Holocene — lasting about 3500 to 4000 years — entered into a cooling trend about a million years ago. Needless to say, all during this time, going back 7500 to 9000 years ago, the climatic influence of the Industrial Revolution was zero. Since the paleo is calibrated to much wider areas ( like the NH ) or to individual seasons, this is not remarkable. You’d need to compare it to a recon that used CET exclusively. Not sure if there is one. Steven, I seem to recall it being mentioned that as few as 100 surface stations would reproduce the GAT without much loss in accuracy. Since the AMO has a good correlation with both CET and GAT, kind looks like a moot point. Since the whole system is pretty much coupled to the tropics and oceans, perhaps that recon splice with CET is interesting. That would be OPTIMALLY PLACED stations. Second the metric you are talking about is GAT, specifically the TREND in GAT. Haven’t we had this conversation before when I suggested a global temperature record was a strange hybrid and one reflecting koppen zones might have some small chance in reflecting what goes on? Aren’t you contradicting your previous scathing reply to me? Mosher is a brown belt in the martial art known as situational logic. Speaking of situational logic, any time you’re ready to explain how your “logic” led you to conclude that the pollsters where “skewing” their samples to rig their analysis to help Obama out by making it look like he was doing better than he was, please do feel free to do so. I, for one, would be interested in reading how you would be accountable to explain how you could have been so completely wrong, and so completely sure of your completely wrong analysis. I mean perhaps you did offer such an explanation but I must have missed it, and I’m sure you’d like an opportunity to clear the matter up. No tony these areas have little to do with koppen zones which you should know are not a natural kind. You might say that these changes will be reflected in changing koppen zones..
Do you even know what a koppen zone is and how it is defined? Are you aware of the changing definitions of these zones? They are not a natural kind but are an interesting tool to use. IN the end they are not very useful as explanatory tools. The reason should be obvious. ‘Some climatologists, particularly in the United States, however, prefer to observe 0 °C (32 °F) rather than −3 °C (27 °F) in the coldest month as the boundary between this group and the colder Group D (Humid Continental).This is also done to prevent certain mild headland locations on the upper East Coast of the USA and Japan from fitting into the C group. So if we look at the koppen classification for the UK and compare it to other similarly classified areas you will see that some of these climate areas go through one set of changes, while others go through different changes.. basically, the koppen classification doesnt clarify anything for you if you are interested in causes. This is simple logical; classification is not a casual analysis.. Thanks, Tony, for your effort to restore sanity to AGW fears. It won’t be easy, but perhaps easier than the task of proving AGW is real. The UN climate talks with its putative carbon trading schemes have become the cash-for-clunkers global politics of today’s social roadblocks to human prosperity around the world. If ever there was anyone with a clear idea as the worthlessness of the UN and the Eurocommies it was George Bush. This is a recent regional reconstruction. In general the global pattern of cooler temperatures around the time of the LIA is well established – albeit with regional variability. European variability seems more likely to have been driven by the Gulf Stream than other wise. Influenced by broader ocean temperatures – the CET seems likely to be reasonably representative of broader conditions and is important for the length of the record. The shorter record of the Global Historical Climatology Network (GHCN) database seems reasonably in agreement. There is little notable change in variability over time. The earlier analysis (Shiyatov 1993, Fig. 1) showed a similar conclusion based on 209 macro fossils and 16 living trees. A maximum tree abundance being reached in the middle of the 13th century. In the first half of the 15th century a deterioration of forest cover came to an end. In the 16th century and first half of the 17th century tree growing conditions were again more favourable, and in the second half of the 16th century another decline of the open larch forests ceased. In the second half of the 18th century all trees growing on the transect died. In the 19th century not a single living tree stood on the transect. The first larch seedlings reappeared at the beginning of the 20th century. These two independent analyses are, therefore, mutually supportive. The upper boundary of open forests has markedly shifted both on slopes exposed in winter to strong westerly winds and in the areas where summer temperatures are the main limiting factors. This is evidence that the pattern of winds and the temperature conditions have become more favorable for the growth of trees over the past 90 years. The growing period begins earlier, and its duration has increased. This allows young larch shoots to complete the cycle of their growth and development and to prepare themselves for wintering under severe conditions. Before the recent climate warming, larch in windswept conditions with little snow was represented only by prostrate growth form. To date, prostrate plants have transformed into multi-stemmed trees up to 5-6 m high and young trees aged up to 50-60 years are mainly single-stemmed. These data on the magnitude of altitudinal and horizontal shifts in the upper boundaries of open and closed forests in the Polar Urals confirm our previous findings concerning the expansion of tree vegetation to higher elevations due to climate warming and increasing humidity in the 20th century (Shiyatov et al., 2007). According to data from the Salekhard weather station the recent mean air summer temperature was 0.9 °C higher and winter was 1.2 °C higher than between 1883 and 1919; and the amount of precipitation also increased by 32 mm in summer and by 46 mm in winter. As the elevational lapse rate of summer air temperatures in the Polar Urals is 0.7 °C, the climate-dependent upper boundary of the zone suitable for tree growth could ascend approximately 100 m. This value is almost three times greater than the actual altitudinal shift of the upper boundary of open and closed forests. In other words, tree vegetation has not yet expanded to the climatic limit because of insufficient supply of larch seeds to tundra areas in the upper part of the treeline ecotone, although it is already close to this limit on some slopes. Thanks for posting another fine piece of work, which extends our overall knowledge of past climate changes, as they compare to those of today. Your observation that paleo records tend to miss the shorter term variations seen in instrumental records is interesting, as this weakness would lead to doubtful conclusions that past centuries saw less climate variability than we now observe (Shaun Lovejoy article in Climate Etc. in January 2013). From the standpoint of extreme variability, just looking back at historical records of droughts, crop failures and famines, these seem to confirm that these events were at least as frequent in the past as today (if not more frequent). The use of CET as a proxy for “global climate” may be criticized by some who are surprised by the findings (no proxy is perfect), but it appears to be a more reliable proxy than paleo studies, especially those based on tree rings (as has been noted elsewhere). Natural variation goes substantially warmer than present. shows the last interglacial sea level which rises to a peak about 9 meters higher than present early in the interglacial, then over a period of thousands of years falls to a bit below modern level, then over the next few thousand years rises 9 meters above modern level again. Judging by this then modern sea level is on the low end of its range for interglacial periods and can go as much as 9 meters higher *naturally* if we presume there were no SUVs polluting the planet 125,000 years ago. Highest annual total: 3964.9mm at Ballaghbeama Gap in 1960. Highest monthly total: 790.0mm at Cummeragh Mtns in October 1996. Highest daily total: 243.5mm at Cloone Lake, Co. Kerry on 18 September 1993. Highest hourly total: 46.2mm at Ballsbridge, Co. Dublin on 11th June 1963. Lowest annual total was in 1887 with 356.6mm of rain recorded at Glasnevin, Dublin. Those of us living through the 1960’s and early 70’s in Britain may think of it as a cold period . Indeed the cool windy wet weather of the early sixties is what first encouraged my family to holiday abroad and in retrospect they were right. :) So you missed all the good weather back home..? Another most enjoyable, careful. post with a couple of unexpected conclusions. Thank you! In this regard the UK stands out as an exception for places at similar latitudes. One fundamental problem in using any single location is that there’s much more noise in local temperatures than in global or wide area averages. If comments above are meant to suggest that the CET is irrelevant as a long term proxy for the changes in either the N. Hemisphere’s or global temperatures variability, than it can be stated that the comments are wrong and misleading, since there is a high degree of correlation between the three relevant data sets. Tony’s work is a valuable historic reference for any climate change researcher. One might sooner discount Antarctic and GIS ice cores because they aren’t a mean of the whole planet. That makes it relevant. But you must take care in over analyzing the data and trying to infer more than you can. Tony tried to make a point about the volitility of the data. There are a few problems with this. D) There are good reasons to expect less volitility in a warming scenario. Look vuk you have a vested interest in CET so you dont want to acknowledge any caveats with respect to it. You view it as some kind of gold standard. It’s not. Like all data it has warts and you do better to understand the data worts than ignore them. CET can inform our understanding but it doesnt determine our understanding. ‘wrong measure?’ do you mean a measure you don’t like? Why do you think it’s indicative only of our tiny unimportant island ? Because others you respect more outweigh those that think it is some sort of wider proxy? wrong measure because it doesnt tell you anything about climate. if you are interested in climate change then the most informative variable to look at is the seasonal difference. Steven: Look vuk you have a vested interest in CET so you dont want to acknowledge any caveats with respect to it. The CET is grandma of all climate data and as such commands respect serious climate researchers, the rest may considered that the granny has succumbed to Alzheimer’s and remembers its youth as the rose-coloured one. Tony, great paper. Among other really interesting things, you point out that all the paleo (and other) smoothing looses the decadal variability which caused the ‘ice age coming’ flurry in the 1970’s and the CAGW ‘panic’ in the 2000’s. You are providing a stabilizing institutional memory of natural variability far beyond what climate models reflect. Good job. use, and the previous warming periods were only apparent warming. From there warmists can then show why the pause is apparent but not real, and we can show how the warming was likewise only apparent, and not 100% “real” warming. Sorry, part of my reply got erased. Redone. Tony, maybe you could do smaller streamlined articles on each point you raised in the opening. I think David Appell showed something significant in his usage of the wording “apparent pause” (suggesting that it isn’t real). He does not apply that to the warming periods, however. I think it helps explain if given consistent use. Tony and the CET are concerned with England, though English records are rich in references to climate change and freakish weather extremes in France, Italy etc. The MWP is written deep into the history of China and Japan (though I still don’t know what day of the week it started). Beth the Serf mentions in her newsletter about the very real and well recorded scare of the 1600s, as glaciers advanced to swallow whole communities in Northern Europe. What was happening in the SH at that time? I don’t know, but the horror El Ninos of the early 1790s, which coincided with one of history’s great human disasters in India, just by chance make their way into the earliest journals of the baby Australian settlements of Sydney and Rose Hill. Just as well the climate changed again, or I’d now be mashing spuds in South Cork. Catastrophic monsoon failure in India, freak summer conditions in Australia’s east. A big colding round the time of an opening Arctic (huh?) in the early 1800s. Then decades of sea level rise (irrespective of increasing Arctic ice), slowing somewhat after the 1870s . Blame Spinning Jenny and a few dark, satanic mills in a corner of England? Forest cutting for navies? Peak oak? Peak mast timber? Alarmists fairly writhe at the mention of history, don’t they? Maybe they should stick to “carbon pollution” and asthma attacks suffered by “our kids”. It will take us much longer to check those factoids – after untangling the verbal trickery. gold mines and whole villages lost to advancing glaciers. the period before and during the Thirty Years War. Peak oak – you getting that WEB? Peak anything is not a valid concept if the anything is a renewable resource. That is the foundation of environmental and energy economics. Work with the system to try to sustain it. Is climate change noticeable? Yes. But let’s consider some facts. Is the Arctic warming? Yes, like everywhere else, with a long-term trend for 500 years rising out of the Little Ice Age at the rate of about half a degree per century, due to turn to cooling at least within 200 years. But is there a hockey stick? No. Tony still peddling proxy doo-doo as factual GLOBAL climatic changes…?. 1538 was 200 years before Cook discovered Australia… Antarctic, Oceania wasn’t monitored by ”Tony’s wooden” thermometers / WHICH IS, MORE THAN HALF OF THE PLANET. In the other half that ‘was monitored, were really those wooden / clay thermometers so sensitive to know in one hundredth of a degree the ”GLOBAL” temp; as the phony ”GLOBAL” temp chart from the professional conmen as Man,& Hubert Lamb are misleading?!?! Tony has always come across as a gentleman in his posts. You should take lessons. You could be the most brilliant individual posting here, but I for one would never know it, because I automatically skip you due to it being garuanteed you will be rude, insulting and disagreeable. truth is the best policy; truth always wins on the end! More rude, insulting, and disagreeable than me? You must be kidding. What’s the 56 on the end of your name for anyway – your age, your IQ, or the sum of both? It is a well known fact that even the dimmest of knuckle dragging torpedomen are smarter than any jarhead. Putting out data, even “reconstructed” data is not the same as lying, unless you’ve knowingly tampered with it in such a way to prove your point. You can disagree with Tony’s conclusions. Doing so without ranting, which is how you often appear from my view, will keep people from skipping past what you say. Look at Springer, he doesn’t rant. Usually. I forgot – I don’t find you disagreeable. And I tend to enjoy the insults you throw out. You have a knack for it and I’m of the opinion that people who can’t take insults have a personal problem. I doubt I will ever understand where people got the idea they have a right not to be insulted or offended. On the IQ bit – apparently I tested out in grade school (Iowa , California standardized tests) with one of 150. I chalk it up to being good at pattern recognition and not an above average level of intelligence. 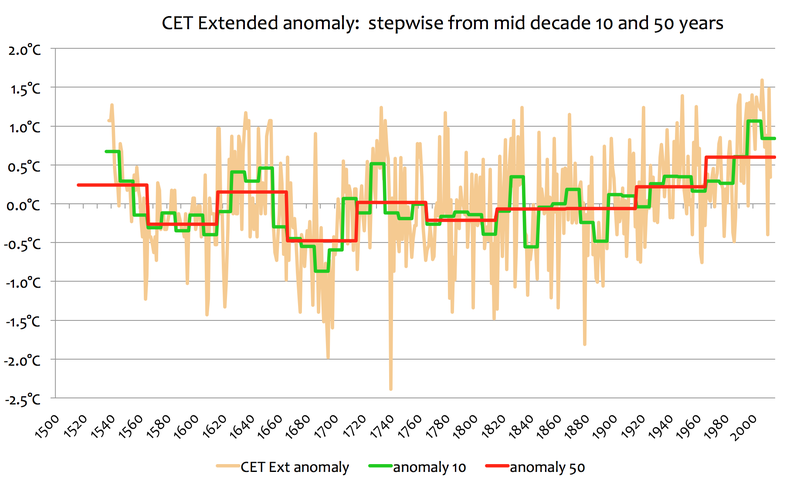 I am fairly sure (and would like to see) if you take a 60-year moving average of the CET you will end up with something like your red line that rises only at the end, like CO2. This happens with global temperature where the date is the mid-point but the last value is the period ending current year. To say that this rise near the end is nothing unusual and just coincidental with CO2 is disregarding an obvious relationship. It will be about the same magnitude too, half a degree. No really – eliminating decadal variability seems a bit silly. But at any rate – what is your residual rate of warming that we shall entirely ascribe to CO2 and why should we give a rat’s arse? I want to see a 60-year lagged mean of CET next to the red CO2 curve in Figure 1, and possibly global 60-year means, and for someone to demonstrate that these are not the same shape (some kind of sports implement). Of the 0.7 C of warming in the 20th century, 0.9 is CO2, 0.2 is the sun, and -0.4 is aerosols. Satisfied? It is no coincidence that shifts in ocean and atmospheric indices occur at the same time as changes in the trajectory of global surface temperature. Our ‘interest is to understand – first the natural variability of climate – and then take it from there. So we were very excited when we realized a lot of changes in the past century from warmer to cooler and then back to warmer were all natural’, Tsonis said. Surely you forgot 0.2 C for the Pacific decadal variation to 1945, -0.2 C to 1976 and another 0.2 C to 1998. Perhaps another 0.3 C in the 1997/1998 El Nino? Any of this working for you? So what’s the residual decadal warming rate shown on your graph – which we have assumed is all carbon dioxide? You are describing a long term temperature oscillation, chief. Like the stuff that is buzzing around your head. It goes around but always comes back. Sustained forcings like we get from CO2 and all the positive feedback reinforcements caused by elevated CO2 don’t come back. Idealized proxy or not, less than 2% of the global record, and the 120-year reconstruction? Every hour the modern instrumental record adds as much statistical information as the entire reconstruction contains. It’s nice that Tony has a hobby, and all, but it is really.. really.. pointless. The instrumental records are a hell of a lot better than the proxies which are orders of magnitude better than Bart’s pull it out of his arse post-normal – or more accurately un-normal – science. But by means look at the modern satellite record. Let’s try to figure out what it means. Not you Bart – I find that interweb wack jobs generally don’t add anything useful to the discourse. He has a hobby horse. When is he going to travel to the middle of Canada and start digging through ancient Native American burial mounds searching for evidence of temperature records? I suppose he can do whatever he wants. I just can’t comprehend the rationale. ditto to the ditto head. Real clever, mimicking the drug-addled gasbag Rush Limbaugh. Someone with strong opinions but lacks the eloquence to express them. He makes his stance known only by agreeing with an eloquent speaker with the same opinions. Teacher: Class, what do you think? accountant lobbyists who demand ever more complicated tax codes to give themselves job security and tax payers headaches. Herbert: Yeah! What he said. You forget – I don’t have a clue who Rush Limburger is and don’t give a rat’s arse. What I see is you parroting Bart – not that Bart is anything more than clumsy and incoherent but that’s a big improvement on your efforts. Clever? Seriously? I think he is thick as 2 short planks. A galah in the idiom. focus on the present. Tsk! The past is allowed to exist for the purposes of uttering hype words like “ever” and “record” and “trend”. Unfortunately, one cannot use such words without implying that the past occurred. It’s slob stuff, but the whole art of alarmism is to alternate a prissy exactitude of calculation with slobbo logic and language. Keeps the skeptics off balance. The idea is to stay in the argument at all costs, and softly sweep the past away like it was an insignificant pile of ash. Yes, for the New Man at Year Zero, the trick is to imply history without examining history, so that “the past” remains like a quaint old sepia photo, and has little life or force. As to the present, there are strict New Man guidelines: what warms is climate, what cools is weather; what fits proves the simplicity of one’s case while what contradicts confirms the complexity of one’s case. It’s simple but it’s complex, it’s uncertain but it’s settled…get it? This farcical twisting is necessary, because history is the enemy, as always. Tony is the enemy. He is to be patronised, marginalised, dismissed. He talks history. Why, that’s as bad as wearing specs in Phnom Penh in 1975. It will cause the seas to rise. There will be more and more of “these severe events”. It will give “our kids” asthma attacks. Stop tonyb. What “global record” are you referring to? Where are the equivalents of the CET in other parts of the globe? A very churlish remark, and directed at possibly the most civil and civilised contributor to this blog. Tony, thanks for this post, and for your unpaid and mostly unsung work on the CET and related projects. I think that your point about granularity is very well made, and often overlooked in debates about climate. For a farmer, or the people who rely on his/her produce, the trends and averages over decades or longer don’t matter much. As in the case of the Dustbowl of the 1930s, the effects were immediate and real. Since the debates about the future of our climates are usually framed in terms of the effect on us (rhetoric about ‘the planet’ notwithstanding), it is easy to overlook the effect of short-term events. For example, where I live we have just come out of a seven-year drought. That is nothing on a long timescale, and not unusual even for the couple of hundred years of records that we have here. But the effect on people’s thinking, perceptions and behaviour was very marked indeed. I won’t go into the details of the political posturing, the snake-oil salesmen etc. You have seen it all in the UK. The point is that tying climate to specific dates (as you have done) is critical to understanding history. And, while 10 years may be barely a dot on a climate graph, it is a helluva long time in politics, or if you are trying to feed your family. You really must stop mischaracterizing the statements of others so egregiously. This remark is directed at you, the person, not at your remark. The original remark of mine was directed at the original posting by tonyb, not at tonyb himself. The original posting presents a biased and inferior sample and compares it to a less biased and less inferior (though still far from ideal) sample. The comparison cannot be leant validity by the passion of its author, or the prejudices of his supporters. It’s an irrational comparison, with overstated confidence and insufficient supporting documentation. It’s nice and all that the legitimate instrumental CET gains some context and perspective from its length. It’s nice and all that there are historical records that can be poured over and filtered and cherr.. er.. cherishedly picked through to sustain the preconceived notions of the researcher and affirm his biases. But it’s something we must not be swayed by to invest credibility where it cannot be validated or verified. The efforts of tonyb are valuable. They’re well worthwhile. They allow us to see just how richly varied the panoply of weather samples must have been in the various niche pockets of conditions in the past. But they don’t give us what we need to achieve the “Noticeable” of the title of the topic. I admire tonyb. I find History interesting. I simply detest tonyb’s bad argument founded on insufficient historical data, and the dyskeptic credence given it in the minds of flat earthers. Not as pointless as using trees as thermometers. Meanwhile of course it was the third warmest May on record. How does that happen during this supposed “cooling” period– all without an El Niño present given us all that extra heat from the ocean? It happens because ENSO neutral can do it. Make it hot. So it is coming from the ocean surface, and the last ONI was still negative. The next one will be zero or positive, and then it’s likely really going to get hot. The ONI is about redefining ‘normal’ over 30 year periods – but it is still about temperature in the Nino 3.4 region and the evolution of ENSO events.
? ENSO neutral would in general mean that there is an average amount of heat flux from ocean to atmosphere on a global basis. During El Niño we get more than average and during La Niña we get less. To get near record temps in the troposphere during ENSO neutral means the troposphere is starting from a higher base. The fact that our last La Niña was the warmest La Niña period on record also indicates the troposphere is starting from a higher baseline temperature. During the next big El Niño, expect all previous temperature records to be broken for high tropospheric temps. R. Gates, our last La Niña was the warmest La Niña period ‘on record’ because we’re at the plateau after the multidecadal warming since ~1975, when we entered an El Niño dominant period. ENSO indices have been shifting with the beginning of this century, so expect colder El Niños and even colder La Niñas. We’re cooling now. When you say “we’re” cooling now, you must mean the troposphere over some short period of time and certianly less heat is flowing from ocean to atmosphere during the current cool PDO. Certainly the Earth as system continues to accumulate energy and will continue to do so as long as GH gases continue their march upward and even for some period after they stop rising. The lack of temperature rise is clear evidence that there is a lack of energy accumulation. Earth is in balance. Temperature is the measure. They made up that Energy stuff because they need something alarmist that no one can really check. Yeah right. The surface temperature is responding to the lack of surface moisture over land. It is an artifact of the lapse rate. 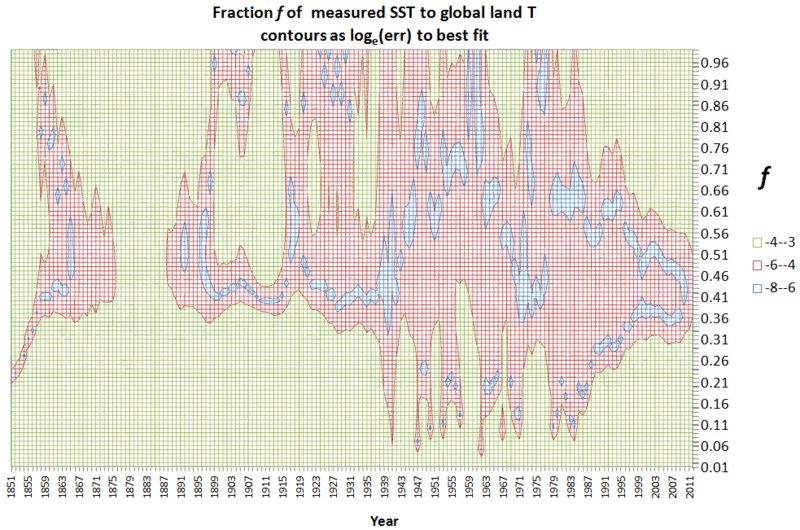 It is about time that we started taking more account of the satellite record for this reason and for the fact that SST is not in thermal equilibrium with the atmosphere. You have a problem with the tropospheric temperature record? So sad – too bad. Just wait til the super La Nina picks up in the SH spring. Brr, stop scaring me you reckless alarmist. There is the quote-miner-in-chief at it again. I really doubt that he has read the entire paper, seeing he is in some backwater and isn’t going to pay $30 to check it out. Here’s a simple explanation for the simple minded. I rang Stewart Franks in 2003 when I realised that these multi-decadal regimes had global temperature implications. I have read dozens of papers from Stewart and the group he formed at the University of Newcastle. Try doing some independent research dweeb – and not just being an idiot. But this is not is not at all controversial in hydrological science. Although from the proxy records – as opposed to the instrumental – the period seems to be 20 to 40 years. This is an idea that is easily confirmed but what we see in response is merely superficial and pejorative. Missed it again Judith? Though this June does seem a bit different from most. Much is made about how much it rains here. Its never bothered me, except possibly the Junes. June in the PNW always seems the most difficult month. We will get bouts of nice weather in March, April and May. I’ve enjoyed 70 F sunny days at the Oregon coast the first week of February. But then Memorial Day rolls around and with it the rain. I am trying to remember if I’ve ever experienced a Memorial Day weekend that was rain free. From there June is almost indistinguishable from January, except maybe for being a few degrees warmer. But then 4th of July comes and the rain disappears until Oct. This June we are well behind last year in precipitation, though not too far off the average. And it has rained all this week. But for the first half of the month it was rather sunny and warm. A nice change. Not around here is a significant part of the global average for May, which has taken 3rd place on certain scales. Oh my, where did you get those beautiful flowers. Texas has Blue Bonnets for a fleeting moment, but that’s about it for blue. Yards here tend to be yellow and red and white and pink. Mine is blue. I plant lots of blue, or blueish. 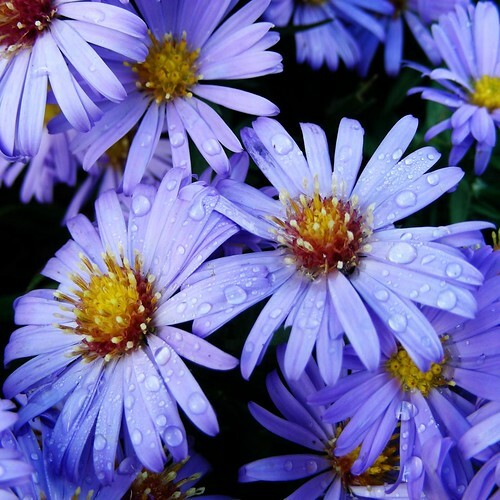 I like asters. Have a couple in the back yard. Hot summers and cold winters will be with us for awhile. Just like happened in the Roman warm period and in the Medieval warm period. This cycle is still valid and this is another one like we had. By the records displayed here by Tony of the CET, clearly something unusual begins appear around 1960. Up upwards movement on the longer term average rising faster and higher than elsewhere in the CET. Not unusual and not faster (~1700). Predictable that Edim will try to Balkanize every discussion. Webby, no need to be rude, it just makes you look silly. Was my statement wrong? Compare the ‘unusual’ warming around 1960 with the warming around 1700. Or the one around 1890. I am in Cambridge for my sons graduation later today so sorry for lack of responses. Congratulations to your son, Tony. Hope it is a dry day! Congratulations to your son and both parents. Thank you. We are very proud of his first in Physics. Unfortunately he has no interest in climate change. specifically refer to periods of ‘warming’ and ‘cooling’. Tony, I went to get an Irish passport recently so I could be a “European” – only to discover that Grandfather Townshend had been take from Derbyshire to Ireland as an adopted infant. Result: no passport, and I’m one quarter Pom! I have to be more respectful of you lot now, so Blade on the Feather, God Save the Queen…and congratulations on your son’s achievements at Cambridge! Now we’ll have to see how long before he moves out. He is doing a phd now, so another three years. Ours is scheduled to start on his Master’s in Computer Science this fall (has a BA in Psychology – great for selling coffee at Starbucks). However if the summer internship he landed goes well, he’ll likely bag going back to school. Perhaps I should ask Dave Springer if he’ll help tutor him. I’m thinking he would enjoy telling a 2nd Lt what to do. Sounds as if your son would be very useful in trying to help us understand the psychology of warmists , enlist him immediately. Yes, David would like to give him advice I am sure. I see her face so vulnerable and young. The family walls, but here she is, alone, without a name. What sad events have brought her here? A childless marriage? Perhaps her early death? But dynasties fail, plans – soon -come – undone. Steve McIntyre who seek ter un -ravel past events. As each dark corner of climatology is exposed to light, a Portrait of Dorian CAGWey is revealed. I don’t mean to demean Tony’s work, but philosophically, do squiggly lines really tell us what we want to know? The trough to peak variability (in one case > 3degC) provides an interesting context for our current period of climate angst. Makes it difficult to argue that what were seeing now is outside the limits of natural variability. A truly fantastic piece of work. As a UK citizen myself (not too far from Central England) I find this article speaks to me as both a citizen and an activist, providing some historical context to the ongoing moral imperative of dealing with climate disruption both here and globally. Activist Joe, please define climate disruption. What is the measure of climate disruption? Please provide a source to a time series chart of climate disruptiveness. Does it rise over time? Oh, it’s just a propaganda term you activists have invented out of whole cloth? One thing you can do with the CET is see how rare a 10 C annual average was. It was really a hot year when that happened in the past a few times per century (maybe a 10% probability), but now the mean of the last 30 years is 10 C. For a normal distribution that is a shift of more than a standard deviation. It is possible that the most of the comments that dismiss the CET, do it often due to lack of understanding of the N. Atlantic’s factor. It is often stated that the CET follows AMO, which is not correct, the AMO summer and winter oscillations are highly correlated. (Spring and Autumn just follow average of the above two). As it can be seen from the above the CET has no 60 year oscillation present, the main characteristic of the AMO. It is because the CET is controlled by atmospheric pressure: N. Atlantic-Arctic in the Summer and the N. Atlantic alone in the winter, while the AMO is a property of the central part of the N. Atlantic. Despite these differences the CET correlates well with both the N. Hemisphere’s and global temperatures (see the above link). Same question again : Why is this so? Answer: N. Atlantic & Arctic atmospheric pressure – polar jet stream link. Position and intensity of the jet stream is dominant factor of the N. Hemisphere, which in turn historically is the main contributor to the global temperature data. It is obvious from the material presented here and from a veritable mountain of solid, uncontroversial scientific work and peer reviewed, published papers that the planet’s climate changes over time. The very expression” climate change” is therefore just a reference to something as banal as “change in the weather” or the tides or seasoanl change. I am reminded of that wonderful scene in Cold Comfort Farm where the old grandmother who has held the entire family in her control by invoking a “haunting” memory from her now distant childhood ” I saw something nasty in the woodshed” . She eventually has her bubble burst by a visitor who has just met her and counters with “that’s great honey, but did it see you?” whereupon normality floods into everyone’s life and their hitherto frustrations expectations are allowed to run their natural courses. When will this delusional self loathing in the West be shown for what it is? Well, let us hope it is before it dies a natural selection of the fittest, as the rest of the world, especially that part presently in poverty, suffers not the delusion that I’ve long called a ‘precious conceit of a Western elite’. In the long run there’s probably some sort of yingyangy thingythangy about it, a balancing act. But why must we be whipsawed on the teeter-totter so savagely? The “delusional self-loathing” will be exposed only when its preening purveyors are taken to the woodshed intellectually. It is impossible to present reliable future projections from a collection of climate models which generally cannot simulate observed change. As a consequence, we recommend that unless/until the collection of climate models can be demonstrated to accurately capture observed characteristics of known climate changes, policymakers should avoid basing any decisions upon projections made from them. Further, those policies which have already be established using projections from these climate models should be revisited. To this end, I suggest a kind of cluster analysis: given a sequence of time periods, each with a temperature value (such as average temp, possibly smoothed by rolling), iteratively merge those adjacent time periods with the smallest temperature differential. I wish I had access to Tony’s entire CET dataset. A decade was chosen as a real measure for human activities and the way we are affected by relatively short periods of changes in the climate. In this respect it is also easy to relate to. 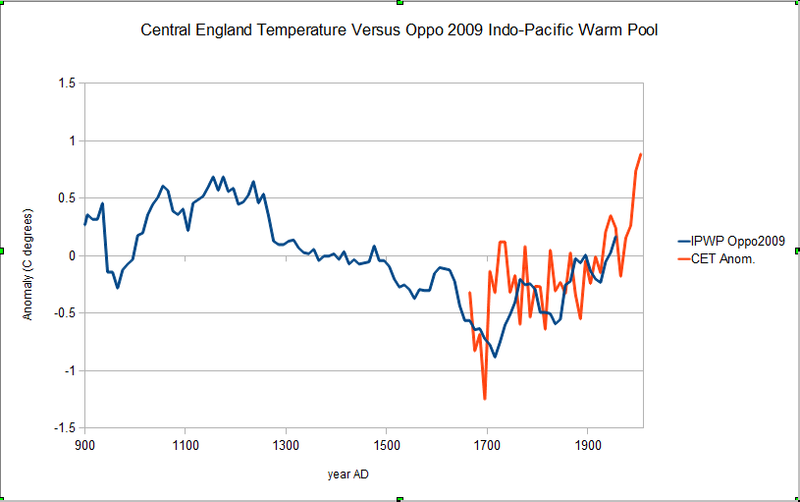 Pingback: Historic variations in temperature number Four-The Hockey stick | Watts Up With That? Tony Brown you are clueless. Climate consist much more then just cycles, one can not extrapolate the climate based on cycles. Past history shows this clearly to be the case,if one goes back far enough..
Thresholds are out there that has caused the climate to change abruptly from time to time and in a dramatic fashion which will not allow the climate to fit into some neat cycle.Two recent examples are the 8200 year cold period and the Younga Dryas cold period. Until one can explain the reasons for the causes of abrupt dramatic climate changes in the past (like in the above) any climate forecast for the future based on just climate cycles is not going to work out. There are too many unknowns and the phasing of the items that control the climate need to be known as well as the duration of time of the phasing and the degree/direction of magnitude change of the items that are phasing that control the climate undertake. To make matters worse does the phasing evenually lead to a climatic threshold being reached. The phasing is toward a cooling trend starting around now and continuing at least to 2040, the question is what will be the character of the cooling trend. Will it be gradual or abrupt with spurts then a leveling off etc etc. How deep will it be ,how long will it last? Beta Blocker most climate indicators are pointing to a temperature decrease for the next several years. Probably to 2040,if not longer..
At one time I had a link to a survey that contained extreme weather events dating back thousands of years. Does anybody still have that link? Thanks to all. Here are two I know of, the one on ‘breadandbutterscience’ is a large PDF near the bottom of the page. Tony Brown’s approach is wrong and does not work. Pingback: ‘Global warming’ versus ‘climate change’ | Climate Etc.